It’s home to Hollywood and the City of Angels, and whether you’re keen to go star spotting on Rodeo Drive, cycle your way down the coastline, soak up the sunshine on the beach or feast on food fit for a king, there are literally hundreds of things to do in Los Angeles. So how can you see and do it all in one trip? The simple answer is, you can’t. To take the pressure off your next visit or stopover to La-La-Land, we’ve pulled together a guide on how you should spend 48 hours in Los Angeles. Brace yourself, it’s going to be action-packed! Check into West Hollywood’s Chateau Marmont on Sunset Boulevard. Built in 1920 using blueprints drawn from a French castle in the Loire Valley, Chateau Marmont has a history as spectacular as its architecture—so of course you want to stay here! This iconic hotel oozes old-school glamour and is utterly charming with its extensive manicured gardens, perfect-for-posing Spanish-style patio and celebrity clientele aplenty. Ideal for #celebspotting. When you’re staying in tinseltown, you need to do something a little touristy (and celebrity-related—it’s hard not to), so take a wander between Hollywood Boulevard and Vine Street to check out the world-famous Hollywood Walk of Fame, where more than 2500 people from the entertainment industry are immortalised. Place your hands where Marilyn Monroe once did and see how your shoe size compares to Ryan Reynolds’. If you want to work up a sweat and get an amazing bird’s eye view over Los Angeles, lace up your sneakers and hit the hiking trails at Runyon Canyon. Located just a stone's throw from the bustle of Hollywood Boulevard, it’s one of the most popular trails in L.A and is a regular workout venue for the likes of Natalie Portman, Orlando Bloom, Emma Stone, Channing Tatum and Amanda Seyfried. Head to famous The Hollywood Roosevelt Hotel and get ready to eat and drink your way around this LA icon—it hosted the first ever Academy Awards and was where Marilyn Monroe lived for two years. 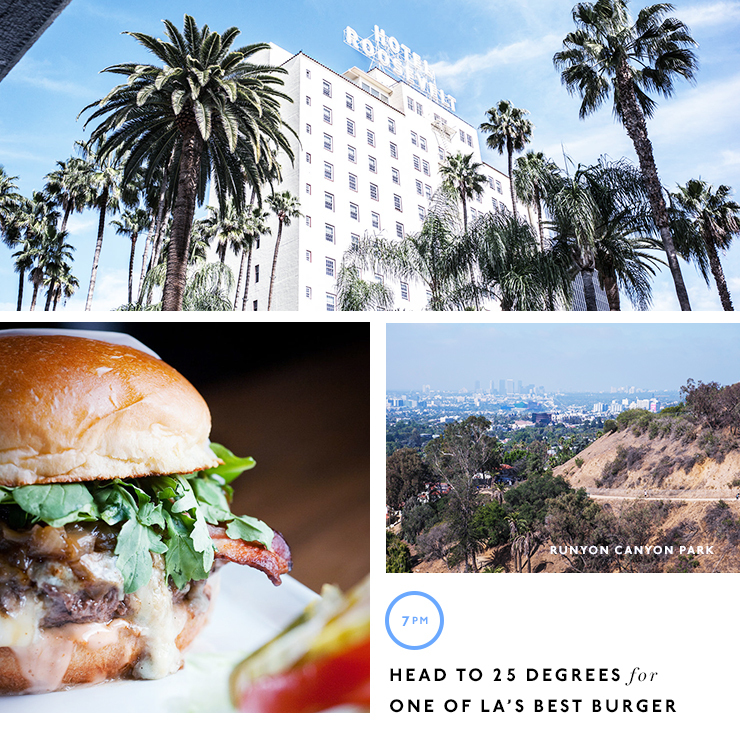 Enjoy eclectic American fare in the grand old Hollywood-style dining room of Public Kitchen & Bar, or pop into 25 Degrees for one of LA’s best burgers. Tucked away on the second floor of The Hollywood Roosevelt Hotel is The Spare Room; a cocktail lounge and gaming parlour, featuring custom-made wooden board games like chess and Jenga. Sip expertly made cocktails, or share a punch bowl with friends, then bowl a few frames on the vintage bowling lanes. Be sure to snap a few pics in the hidden photo booth while you’re there. Dance the rest of the night away at La Descarga. It takes a bit of effort (and a reservation) to get into this speakeasy-themed Cuban oasis but your persistence will pay off. Trusts us. Enter via a run-down stair well into a dark and decadent hideaway filled with burlesque-style salsa dancers and a secret Cuban cigar lounge. Head to The Griddle Café for breakfast. As the go-to pancake joint in LA, their flapjacks are oversized and come in a variety of flavours. With names like Scotch On The Rocks, Hear Me Roar and The Golden, this morning’s breakfast comes with a side of celebrity. What did you expect? 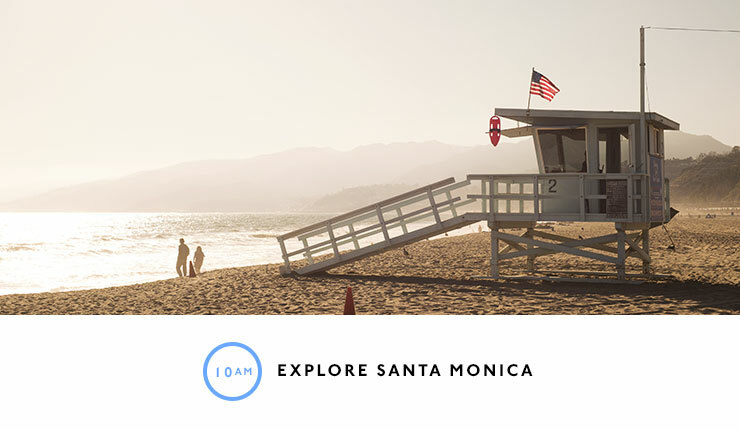 With breakfast done, head for the oceanside suburb of Santa Monica to catch gorgeous ocean breezes and for a spot of shopping. You’ll know you’ve arrived when you spot Santa Monica Pier’s famous ferris wheel. Take a stroll along Third Street Promenade to shop big name US brands, while Santa Monica Place is home to all the department stores such as Bloomingdale’s and Nordstrom, and designer labels. Rent a bike and pedal your way through some of LA’s most popular areas; from Santa Monica Pier past Muscle Beach and down to Venice taking a pit-stop at the Venice Beach Boardwalk to take in the plethora of street performances. While in Venice, kick back with a few beers and lunch at James’ Beach. Located just half a block from the world famous Venice Beach, James’ Beach has a local rep for great food, drinks and wine (not to mention the marvellous people-watching opportunities) plus it’s home to the Mahi Mahi fish tacos which were immortalized in the film, I Love You, Man. Lock up your bikes and wander along the man-made canals that made the area famous when they were built in the early 1900’s (yep, the suburb is named after Italy’s Venice) before stopping at Salt & Straw. This Portland-based gourmet ice creamery serves up tastebud-tantalising flavours such as salted, malted, chocolate chip cookie dough, avocado and strawberry sherbet and Stumptown coffee & compartes love nuts. 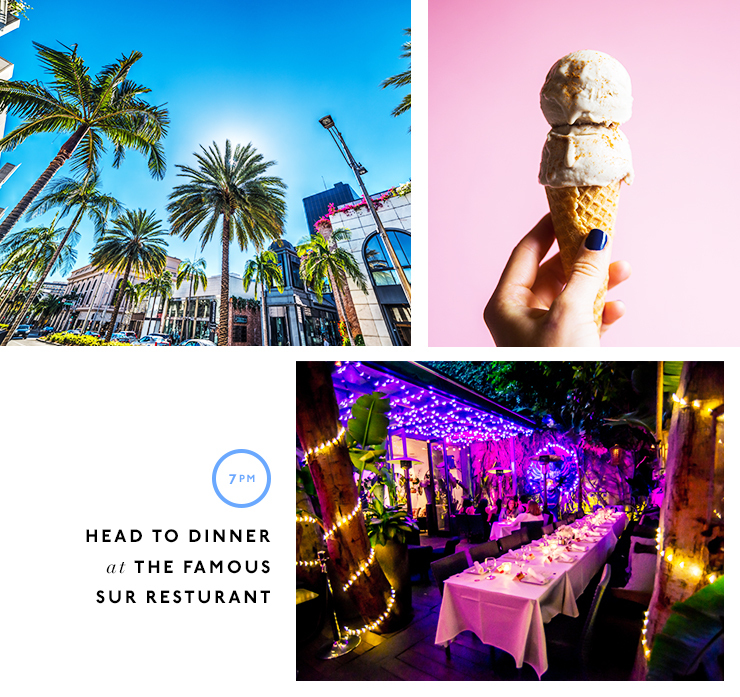 After chowing down on multiple scoops—because of course you’re having two!—ride back to Santa Monica, swap your bike for an Uber and get ready to flex the plastic on Rodeo Drive. Even if your budget only allows for window shopping it’s worth a stroll to see how the seriously wealthy residents splash their cash. Fans of the reality TV show Vanderpump Rules can’t go to LA and not visit the restaurant where the show is based, SUR in West Hollywood. Owned and run by Lisa Vanderpump Todd, there’s a chance you’ll spot some familiar faces. Be sure to try the fried goats cheese balls and when it comes to cocktails, keep things sweet and order the Strawberrini made with Vanderpump’s own vodka and fresh strawberry puree. Open until 2am, The Den of Hollywood on Sunset is the perfect spot for a midnight snack. Bacon lovers will froth over their rasher-themed menu: bacon-wrapped dates, loaded tots topped with cheddar, bacon, malt vinegar aioli and scallions, the ‘Proscuitto Mac’ and ‘Deluxe Burger’ all come with extra crispy bacon. Drool. Prepare for an action-packed day, trading the glitz and glamour of West Hollywood for the vibes of Downtown LA. Carb-load for the day ahead at Grand Central Market, a European-style food hall which has so much great food on offer it can be overwhelming to choose. Coffee lovers will be hard pressed to leave without a G&B Coffee and while the lengthy, winding queue of people waiting to order at LA institution Eggslut is likely to put you off, we can guarantee you it is definitely worth the wait! 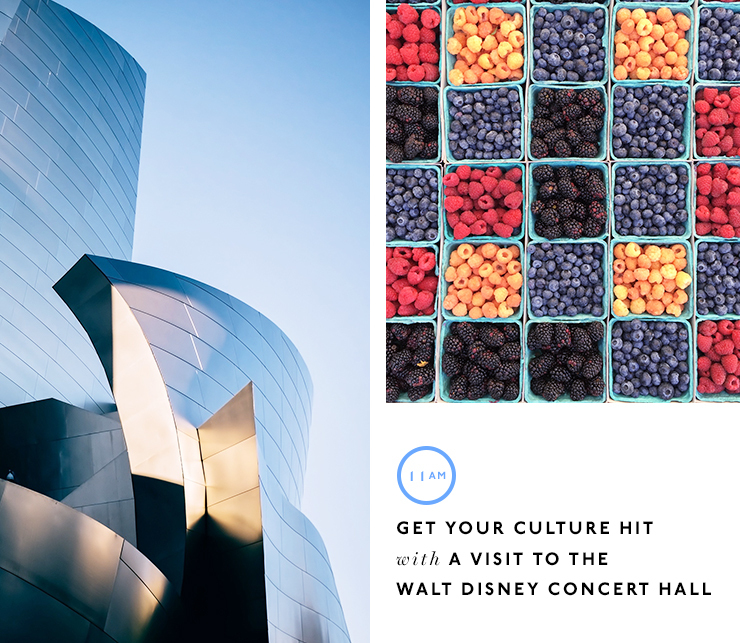 Get your culture hit with a visit to the Walt Disney Concert Hall. The hall is home to the Los Angeles Philharmonic Orchestra, but it’s also appeared in a number of TV shows and movies including The Simpsons, 24, Iron Man, Brothers and Sisters and Glee. Refresh and refuel over lunch at hands down one of the best places to eat in LA, Bottega Louie. Known for having probably the city’s best pizza, sit down for a slice or two, grab some insta-worthy shots and watch the likes roll in. And don't leave without buying some of their decadent macarons. Head high in to the sky and check out the spectacular 360-degree views from the OUE Skyspace LA at the iconic US Bank Tower. It’s also home to the Skyslide, the 45-foot-long Skyslide that takes thrill seekers to heights of almost 300 metres! Approximately 4 feet wide and made entirely of 1-1/4 inches thick glass, you can really take in the view as you slide in between the 69th and 70th floor. Head down to Spring and 5th to check out the literary treasure trove, The Last Bookstore. The store opened in 2005 with one aim; to keep the paper and ink book business alive. So help the crew out and buy a title or two. Recently named as one of the 20 most beautiful bookstores in the world, The Last Bookstore is home to more than 250,000 new and used books (and novelty books which make AMAZING gifts for everyone back home) as well as thousands of vinyl records and graphic novels. Craving something sweet? Swing onto Spring Street and grab some afternoon delight at Peddler's Creamery. Peddler’s produces artisan bicycle-churned (nope, that’s not a typo) ice cream and frozen desserts. As well as the usual suspects, flavours also include Raspberry Poptart, Sweet Potato Pie, Candied Kumquat, Snickerdoodle and Maple Pancake Batter. There are plenty of beautiful people in and around Los Angeles, but there is also an abundance of incredible artwork. LA’s street art scene is a roving feast so jump in a cab and head over to the Arts District in Downtown LA to get insta happy. Once you’ve filled up on some incredible street art, make a pit-stop with a few brews at Angel City Brewery—a leader in the LA craft beer scene. Don't forget to take your camera to snap a pic with a set of Colette Miller's Angel Wings. Avoid the 405. This freeway seems to be perpetually gridlocked, especially between US 101 and Long Beach, but don’t even think about going near it in rush hour. Skip the overpriced movie star home tours and don't buy the maps you'll find sold on the roadside either; many are completely inaccurate and cost a fortune. If you’ve got time up your sleeve, try your luck and line up in the hope of making it into the audience of a live sitcom or talk show recording. Check out the stunning installation of Chris Burden's Urban Light at the Los Angeles County Museum of Art. Let’s be honest, you’re never too old for a trip to Disneyland or Universal Studios. Stock up on fresh produce at the Original Farmer’s Market, which dates back to 1934. Head Downtown for drinks at The Standard’s Rooftop Bar and Pool. If the view over the city doesn’t get you, there are waterbed pods, DJs and ping-pong tables. Sweet! Hire a convertible and cruise along Mulholland Drive, the location of many a Hollywood chase scene.